Does the Government Believe that Pakistan Needs “Protection” from Islam and Its Khilafah?! 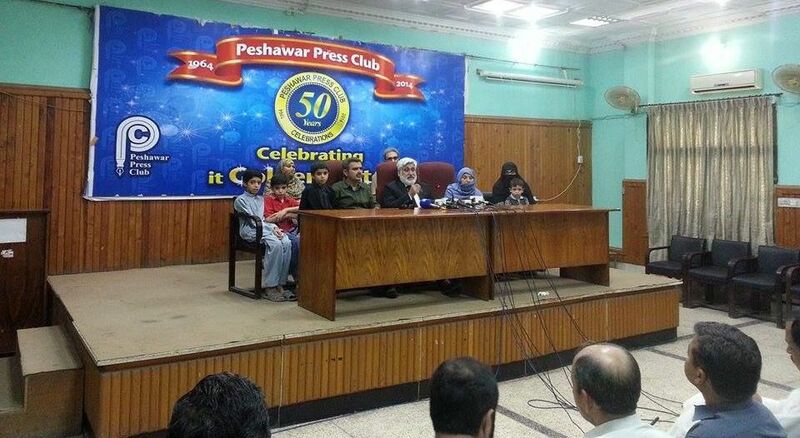 A press conference at Peshawar Press Club was organized by the lawyer and the family of Engineer Aga Tahir, who was arrested under the Protection of Pakistan Act (POPA). The family stated that Engineer Aga Tahir graduated from Faisalabad Agricultural University as a textile engineer. Engineer Aga Tahir was arrested on 5th December 2014 in Lahore, where he was residing because of his business. Even after a lapse of eight months, neither has the judiciary provided bail nor has the government shown any seriousness in pursuing the trial. The family said that in Pakistan, which was created in the name of Islam, political struggle for the establishment of Khilafah and calling for the implementation of Islam has been treated as a criminal act by the government. It is clear that the government is acting according to the example of the British Raj that occupied the Indian Subcontinent previously, by keeping the sincere Muslim behind bars as long as possible, just because of his political views. The family said that Engineer Aga Tahir’s past is absolutely clean and the government knows that if it prosecutes him, it will not be able to present any proof in order to establish that he committed a crime. The family demanded from the judiciary to end this oppression and release him immediately. Hizb ut-Tahrir Wilayah Pakistan condemns the continuing persecution of those undertaking political struggle for the implementation of Islam and the return of the Khilafah to Pakistan. It asks, does the government really believe that the Muslims will accept that Pakistan must be “protected” from Islam and its state, the Khilafah?! Under POPA, thousands of people have been booked and thrown behind bars within the last one year alone. Even after so many months, the government has not appointed an appropriate number of judges. Moreover, in some cities not a single judge has been appointed. This clearly shows that the government wants to cut the tongues that raise the word of truth against its treacheries, under the pretext of the so-called “elimination of terrorism.” However, in the past Firawn, Nimrod and the Quraish failed to silence the call of Haq (Truth), even whilst employing extreme forms of persecution. Similarly, the present day oppressors will fail in this world and the hereafter. The light of Allah swt will surely become dominant as He wishes. So Hizb ut-Tahrir demands that the rulers desist in their tyranny and the very least is that they stand aside to make way for the march towards the Khilafah. Standing in the way of real change is the action of the foolish and it will not be forgiven by the Ummah in this life or by Allah (swt) in the Aakhira. "جو اس (محمد ﷺ) کے حکم کی مخالفت کرتے ہیں انہیں اس بات سے ڈرنا چاہیے کہ وہ کسی فتنہ یا درد ناک عذاب میں مبتلا نہ ہو جائیں"